Well the last weekend of 2012 is going out with a bang. . . well not really. More like a sneeze. I've been sick all weekend and literally been in bed sleeping or watching tv. I haven't even had the energy to blog. But since I've slept all day I'm not feeling a little better. 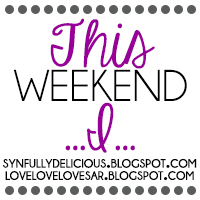 Thought I would tell you about my very (un)exciting weekend. Friday night I went to a surprise birthday party for Kendall's husband. It was a fun and low key night. I sneezed numerous times which was my first clue that I was likely coming down w/ a cold. Saturday morning I had a much needed massage. It was very relaxing! Saturday afternoon I met up with Jaime and her girls downtown. They went to see the Nutcracker so we had a late lunch. I laughed b/c they took a pedi cab from the theatre to the restaurant which was only a two minute walk. It was snowing already so I think the girls liked it! I was hoping the margarita would kill the cold germs but no such luck! I've been in my bed ever since. I've managed to drink about 2 gallons of hot tea, watch several Hallmark movies, watch 2 On Demand movies - Pitch Perfect and Friends With Kids and sleep a lot! Not what I would call a very exciting way to ring in the New Year but thankful that I have this time of to rest and recover. 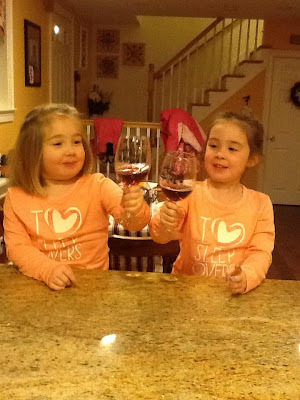 Peyton and Ella wish you a Happy New Year! Friday already!? 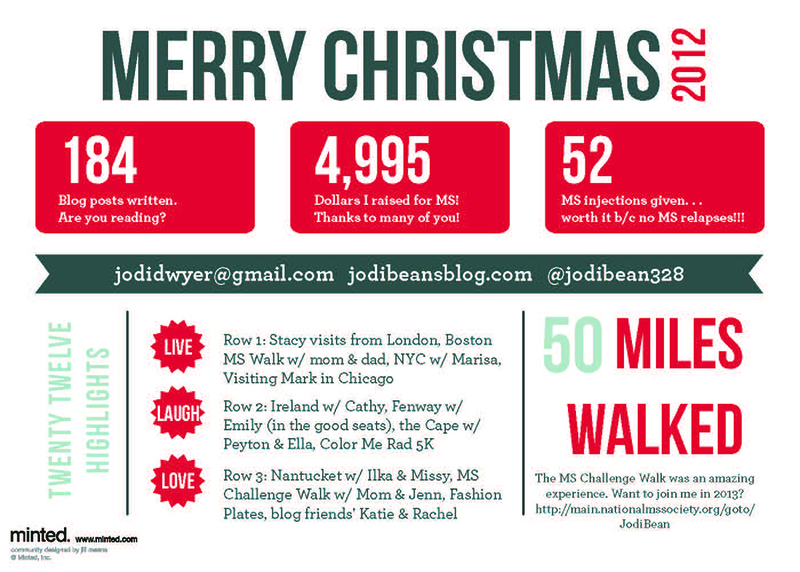 That will literally be the only time all year that you see those words typed on my blog! Haha! I love short work weeks and I'm really looking forward to my 4 day weekend. I don't have a lot planned and that is just the way I want it. 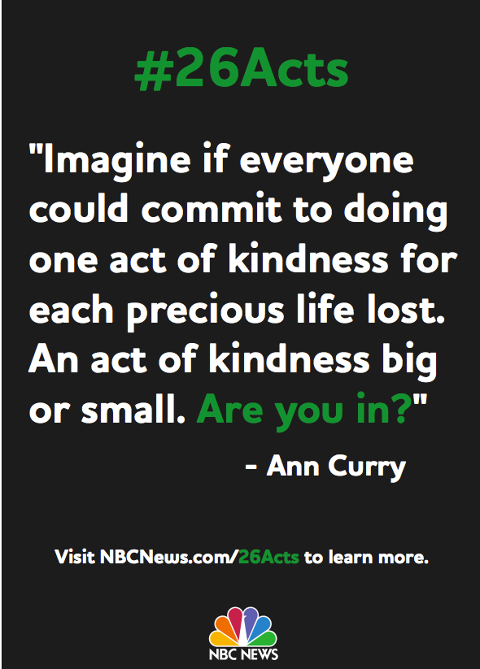 I've decided that on January 1st I will start #26Acts. Each day I will do one thing and report back to you about how it goes. I'm trying to focus on things that don't require spending a lot of money. I've received many great suggestions but still need more so leave me a comment if you have an idea! Want to join me? The more the merrier. I think this is such a great idea in general but I love even more that it came as a way to honor the Sandy Hook tragedy victims. What a great way to honor them. 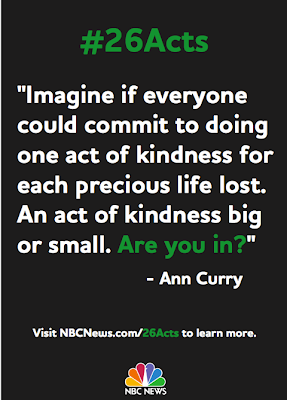 I'm really excited to start out 2013 with focusing on doing nice things. I hope it becomes a theme for the whole year. 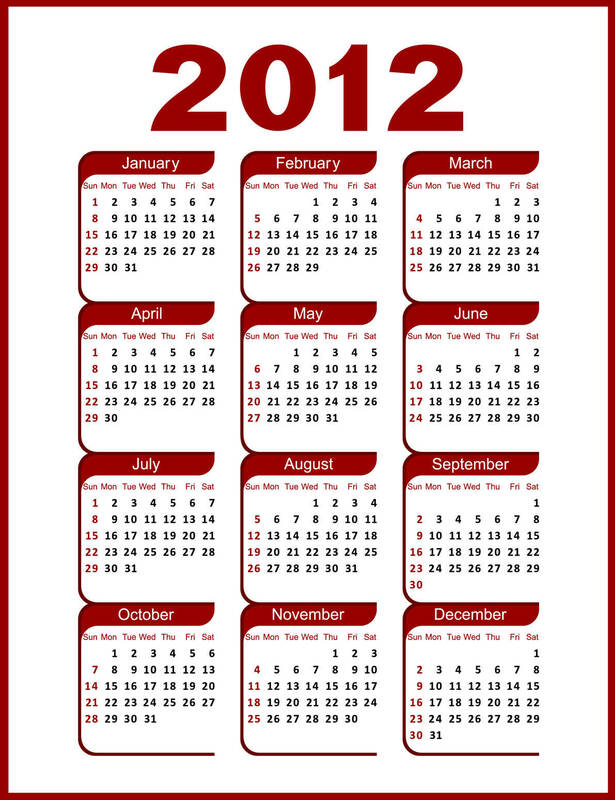 I really can't believe we only have a few days left in 2012. This year has flown by! I'm trying to decide if I should do a "Year in Review" post? Do you guys like reading them? It seems like a bit so it will depend if I can find the time/motivation this weekend. I've never done one before but think it is a fun way to look back on all I've done this year. . . I hope everyone has a great weekend - hopefully yours is a long one too! Is it over already? It always goes way too fast! 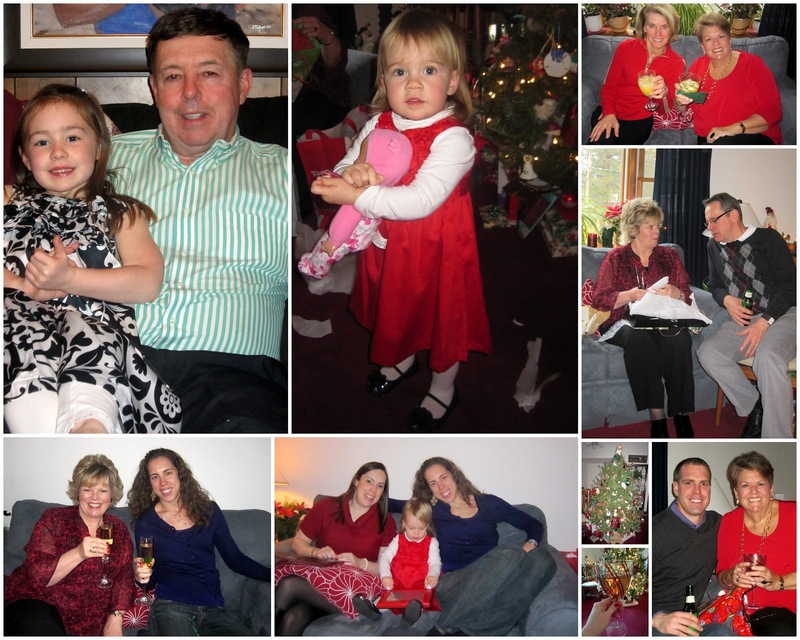 It was a wonderful Christmas and I'm so glad I had yesterday off to rest and relax. Now it is back to work for a couple of days before another break! Christmas Eve we did our usual - Chinese food at Allan's house. 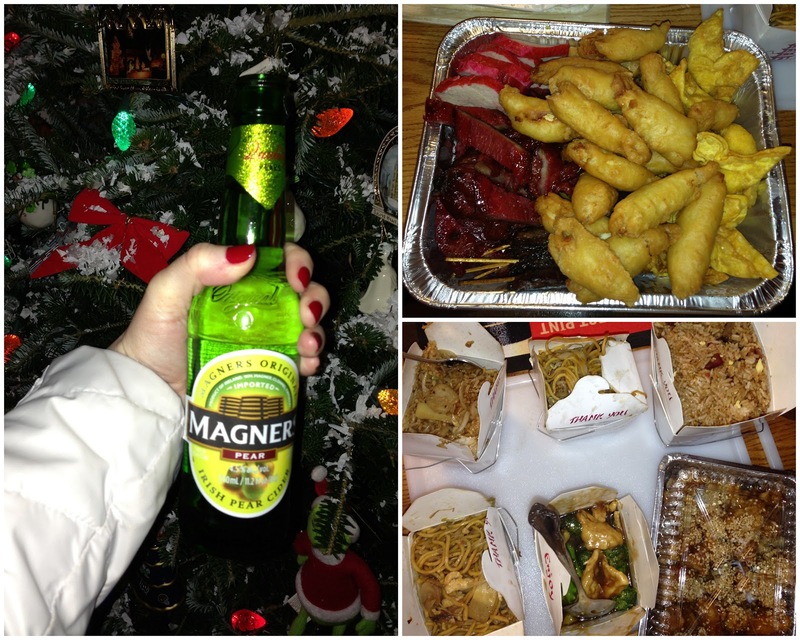 He even bought me Pear Magners (and just in case you were wondering Irish cider and Chinese food go great together)! Unfortunately my Tim, Jenn, Peyton and Ella couldn't make it due to sickness. We missed them! 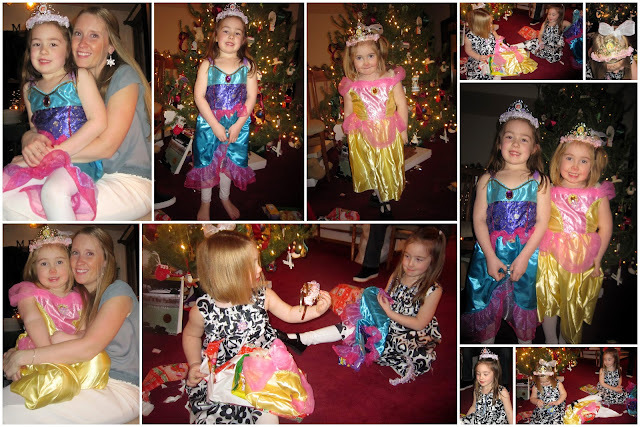 I gave Peyton and Ella princess dresses. I knew they were a big hit when they wanted to put them on immediately. But I would have to say I was out done by Uncle Scott. . . He gets the "award" for giving the favorite gift. 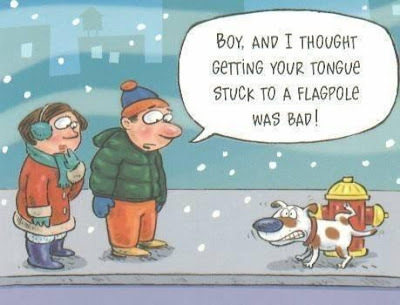 He gave Ella the Doggy Doo game. Oh yes you read that right. Want to know the funniest part - Ella knew what it was! Ha! Basically you put some play dough like substance into the dogs mouth, squeeze the lease, and yes he poops! 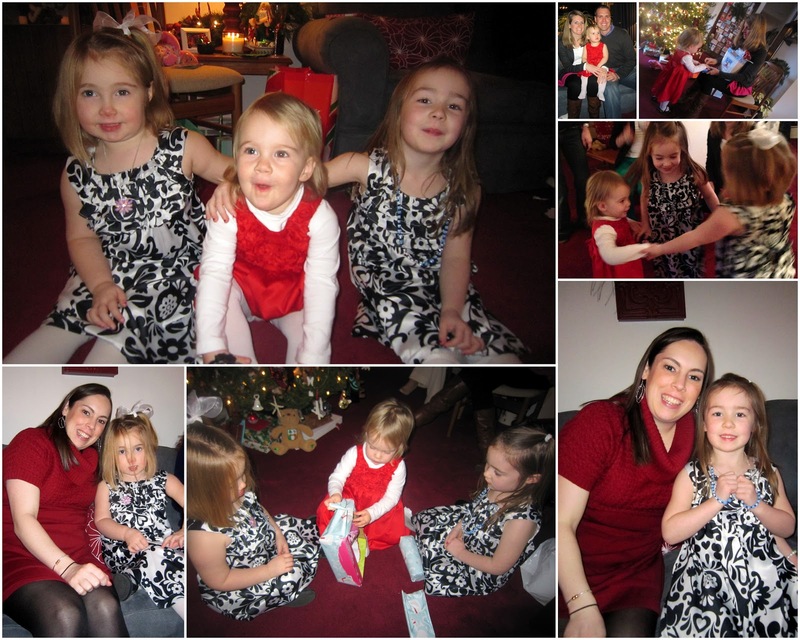 The girls LOVED it and as you can see from the outfit changes they played it multiple times. 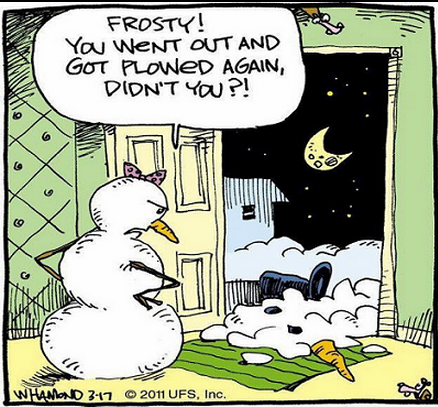 Too funny!! 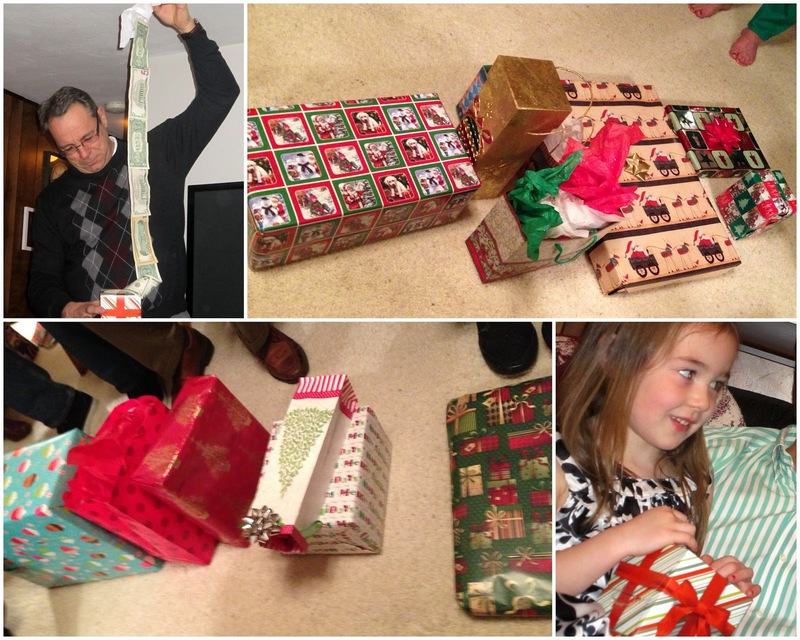 The Yankee Swap was really fun this year. For some reason there was a lot more "stealing" than usual. One popular gift was the tissue box filled w/ money. Peyton and Ella thought it was pretty funny when it got stolen. Peyton was guarding it pretty well! 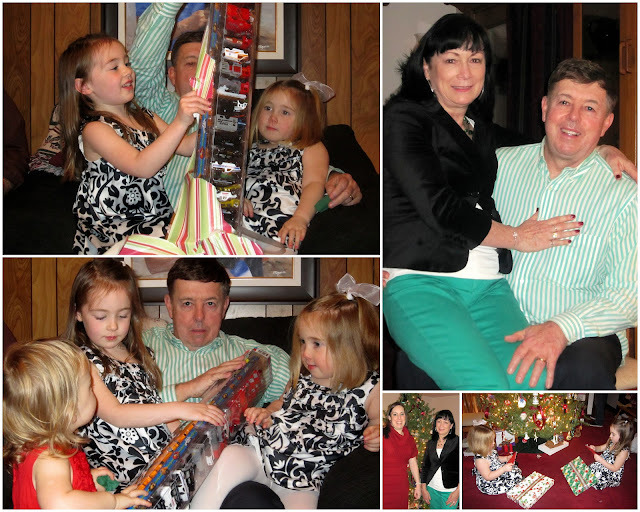 All in all it was a wonderful Christmas. 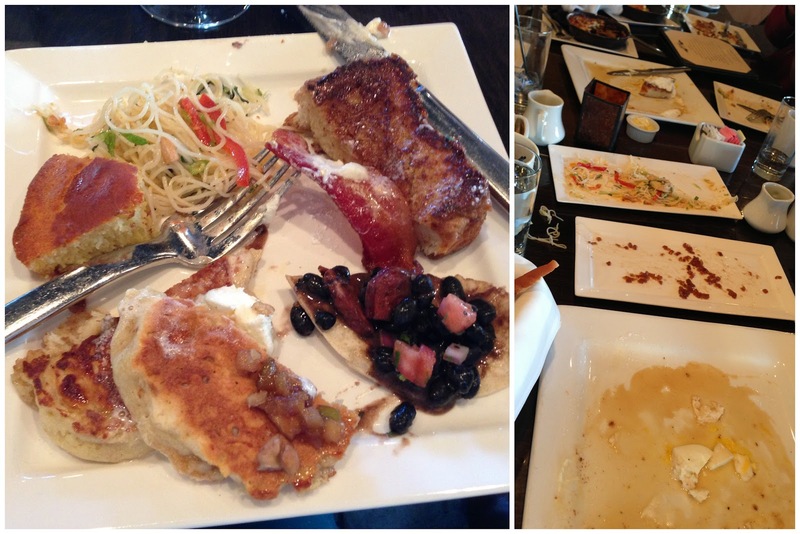 We ate, drank and ate some more. 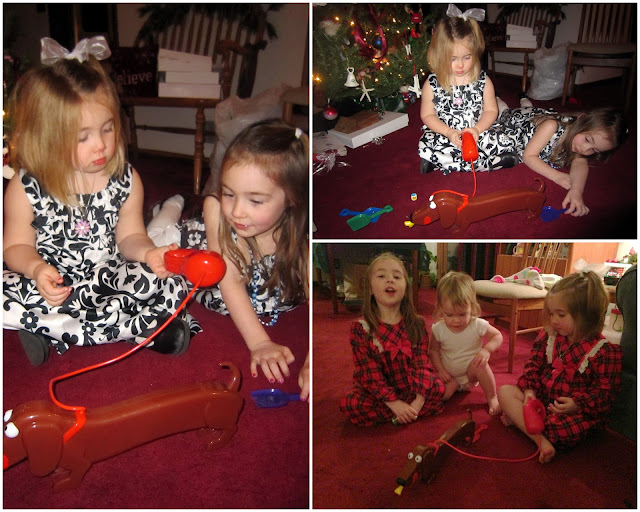 Peyton and Ella seemed to open gifts all day and had tons of fun despite being sick. Oh and don't worry. Auntie Jodi didn't forget Neely. . .
Christmas Through The Years. . . I hope everyone has a wonderful day. 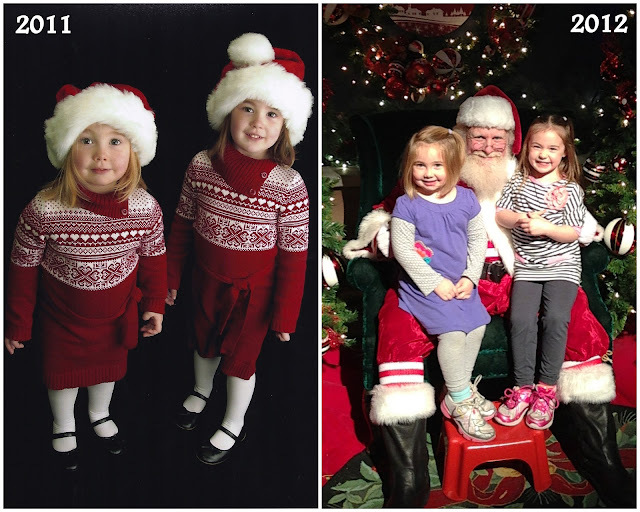 I thought I would share some pictures of Peyton and Ella through the years. 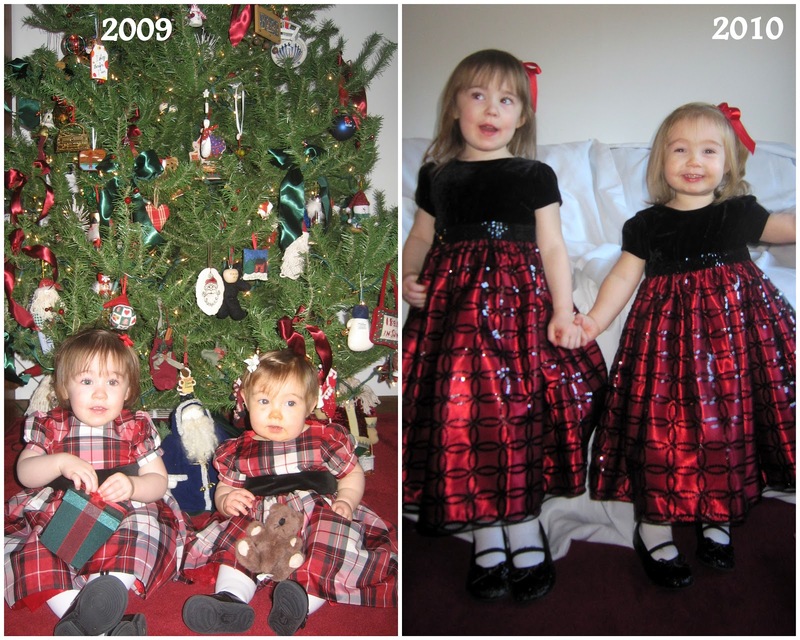 It is so much fun to see how they have changed! 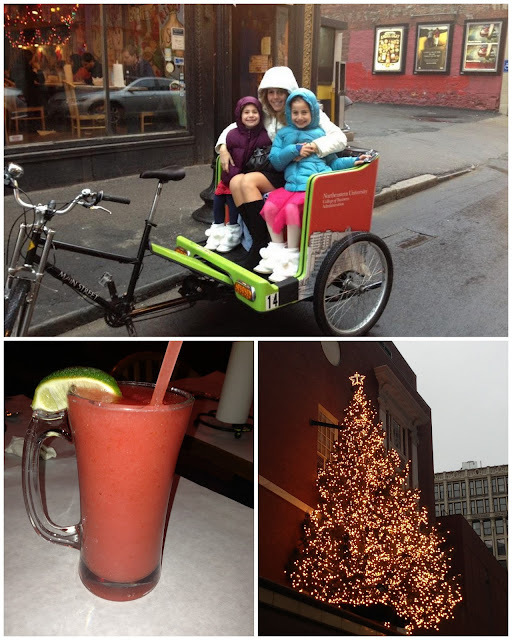 The last weekend before Christmas was very relaxing and fun for me since I was done with all of my shopping and didn't need to do any last minute runs to the mall! 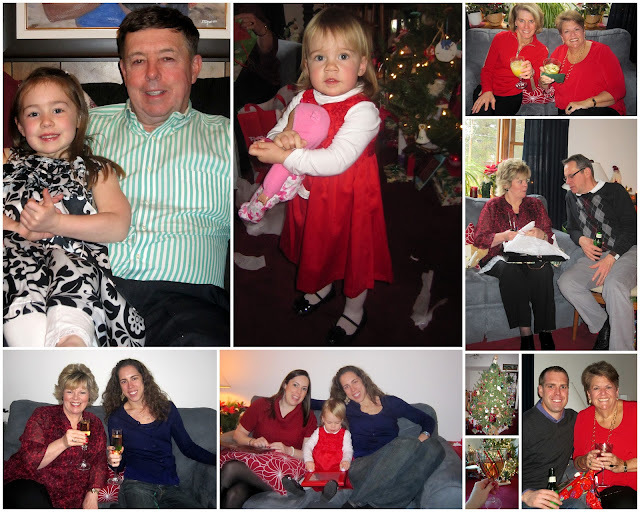 This Weekend I. . . went to Missy's house to celebrate Christmas with her and Ilka. 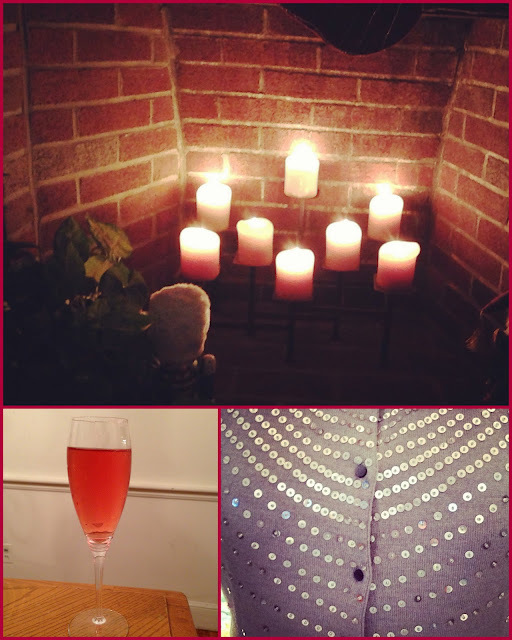 I wore my sequin sweater that I got at Banana last year after Christmas for a great deal! We enjoyed some champagne with pomegranate and lots of yummy appetizers. Oh and I love Missy's fireplace with all of the candles. So pretty. It was such a fun evening with friends. 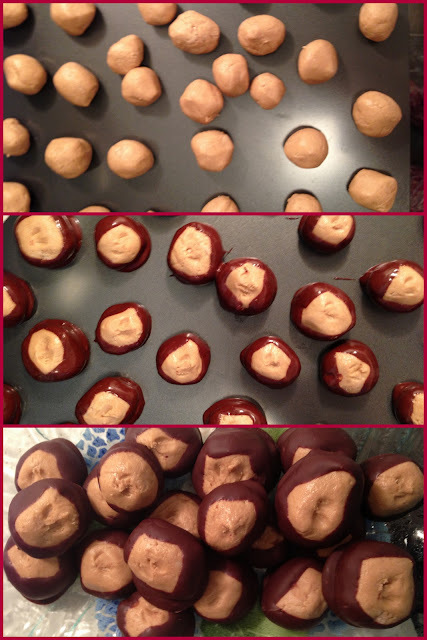 This Weekend I. . . made Buckeyes! 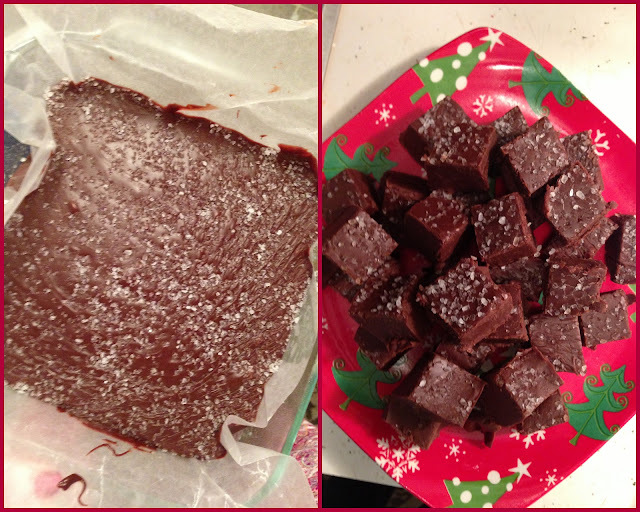 This Weekend I. . . made Chocolate Nutella and Sea Salt Fudge. I brought some of each to Georgina's house for her cookie party. It was a lot of fun eating so many yummy treats! This Weekend I. . . went out for drinks with Georgina after the party (we needed something to wash down all the sweets!) Ha! 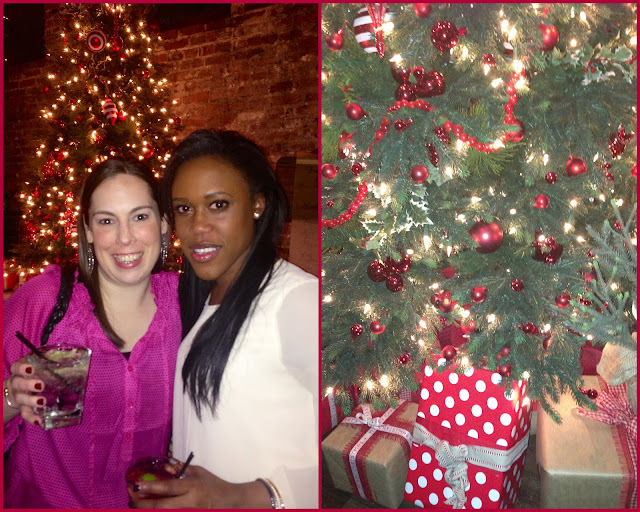 The bar was decorated for Christmas and looked so pretty! 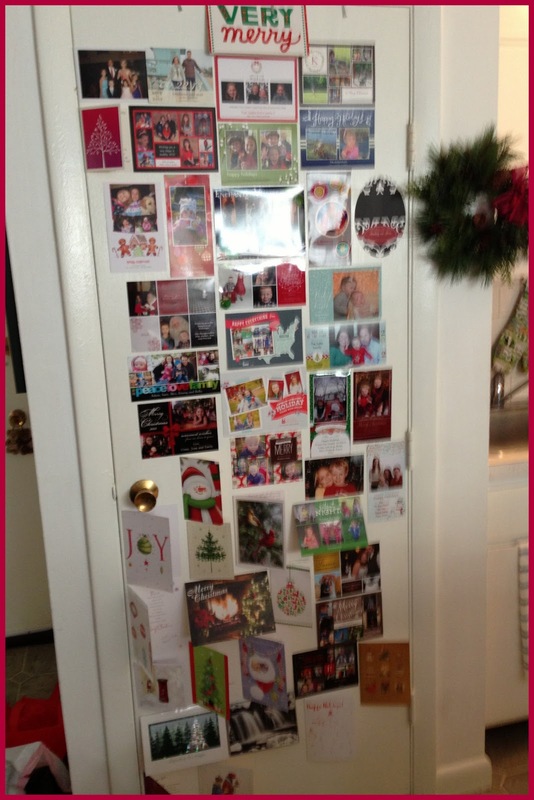 This Weekend I. . . got more Christmas cards in the mail and my door is just about full. Love it! This Weekend I. . . watched a few movies. 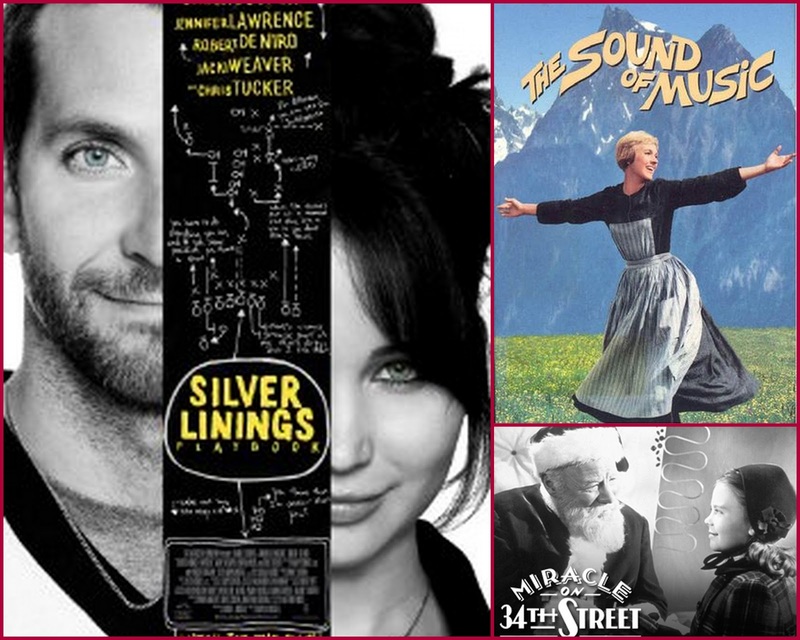 I saw Silver Linings Playbook in the theatre and it was EXCELLENT. I highly recommend it. I really love Jennifer Lawrence. This role was so different than her role at Katniss in The Hunger Games and she has proven to me that she is a great actress. The fact that she is gorgeous doesn't hurt either! I was so happy that two of my favorite movies to watch at holiday time were on last night. 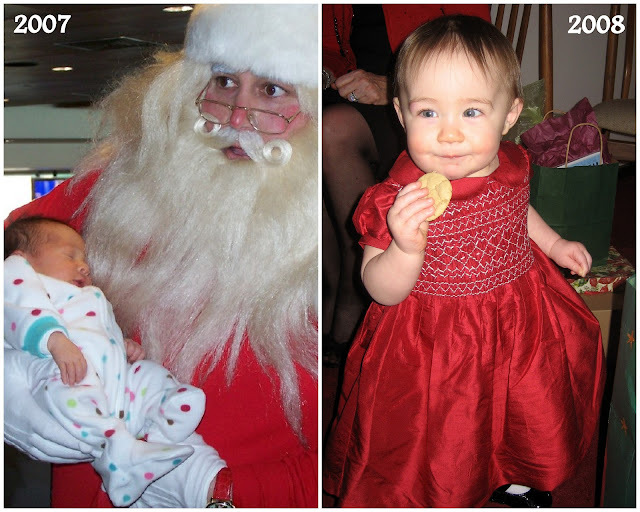 First I watched Miracle on 34th Street (the original which is the best one) and then The Sound of Music. Both of these movies make me so happy! This Weekend I. . . saw this picture of my niece Ella (aka Wonder Woman) and her cousin Maddy (aka Bat Girl) and got a good laugh. 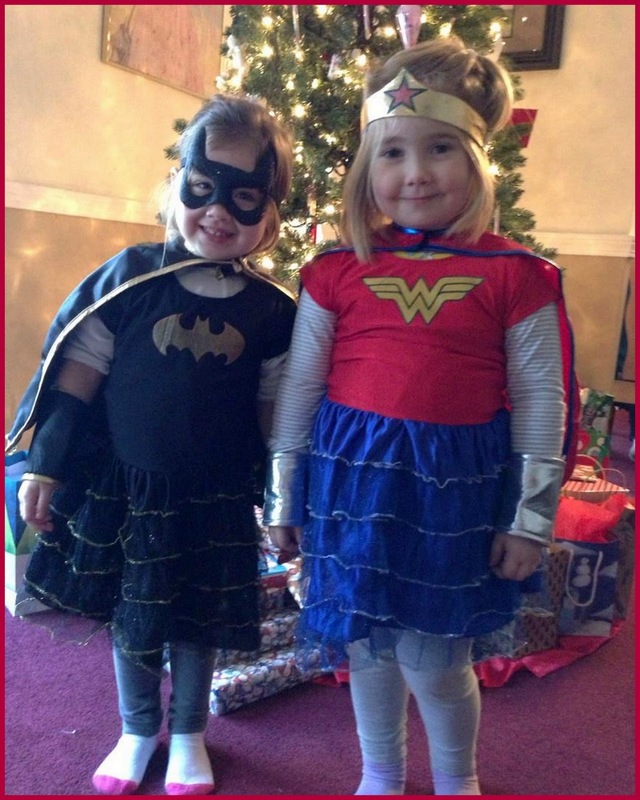 They are too cute for words. Sadly Peyton was sick this weekend with a high fever so I'm guessing she missed out on this fun. Hopefully she is feeling better for today and tomorrow! Fabulous weekend leading up to Christmas Eve celebrating tonight and Christmas Day tomorrow. I can't wait! 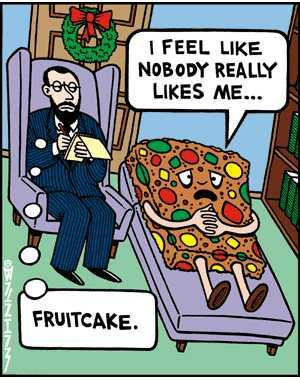 Love that I'll be off the day after Christmas to recover! Merry Christmas everyone. I hope you have a fabulous day with family and friends. Not sure if they are doing this one today but either way I played along! Working in a hospital at the holidays can be fun. 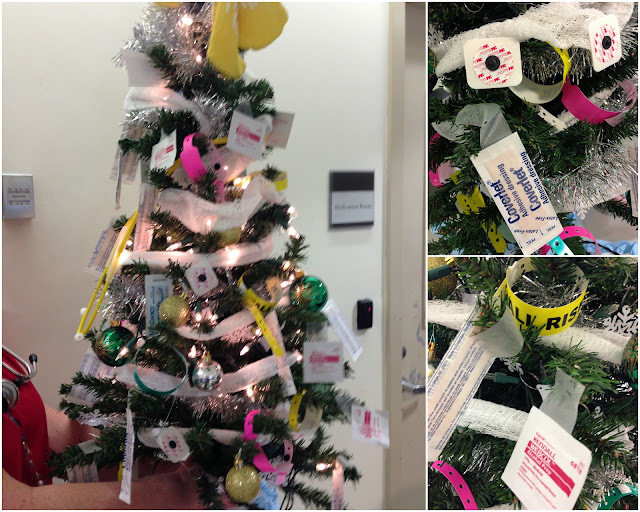 . . the nurses on one of the units decorated their tree using some medical supplies. Haha! Hope everyone is having a great weekend before Christmas. I'm done with shopping but still need to wrap and bake! Did this week drag for anyone else? 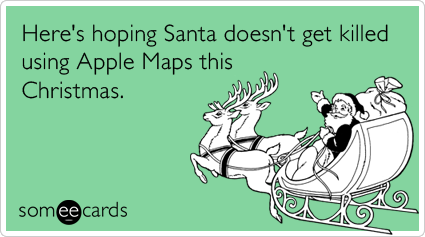 It is probably just because I'm excited for Christmas and time off from work. I did not think this day would ever arrive. . . literally! Today was suppose to be the end of the world right?! I guess the Mayans were wrong. Last night I babysat Sammy and Jake. We went to a Chinese restaurant for dinner and this was my fortune. I think this is very true and fitting for what is going on in the world right now. I hope our "response" is a good one because we've lost far too many lives due to gun violence. When we got home I gave them their Christmas gifts (and they made them pose for a "blog" photo)! They gave me a Target giftcard! 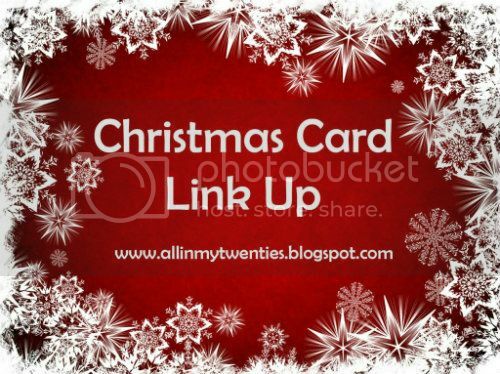 I can't wait to use that!! We then played a competitive game of Sorry! I won! That game has some crazy new rules and I think someone was being sent "home" every other turn! Haha! Once the kids were in bed I watched Elon on TV! they So very exciting to see my college on TV! Unfortunately they lost to Duke but come on now who really thought they had a chance to win!? Its an honor just to be on TV right? So that was my night. Now one day work, two days off, then one more day work and two more days off. I have Wed off rather than Christmas Eve and I'm so looking forward to it! bringing me some happiness after such sadness. I've found myself feeling sad many times this week. As much as I try to avoid the news at the same time I'm drawn to it. I can't stop watching the continued coverage about the Sandy Hook tragedy. Thankfully there have been some really nice things that have come out of all the sadness. Here are three things that have made me smile this week. 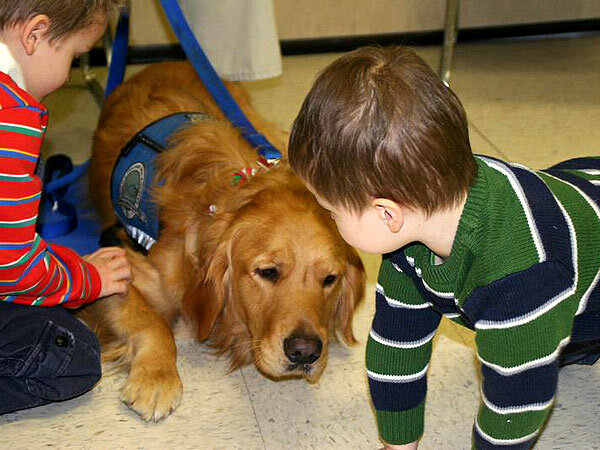 Seeing all the media coverage of the "comfort dogs" who are helping the community of Newtown makes my heart happy. 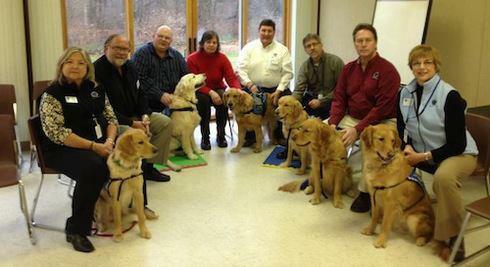 I am a big fan of "pet therapy" and even started a program here at my hospital. Cooper visits the patients each week and I've seen first hand the positive impact it has. 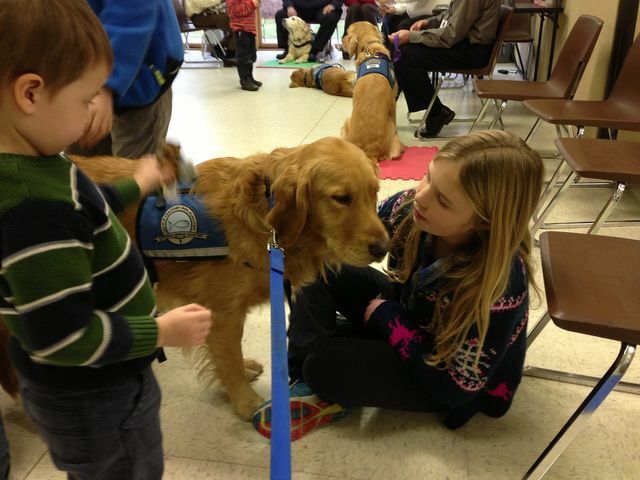 I'm so glad that dogs are being used to help the grieving children and adults in Newtown. I hope it provides some sense of comfort during this very difficult time. To read more about this go here and here. Wow. It still gives me chills every time I watch it. Well done and so moving. I've always know that teachers are our unsung heroes but hearing these stories about the teachers at Sandy Hook Elementary School only confirms that they are true hereos. 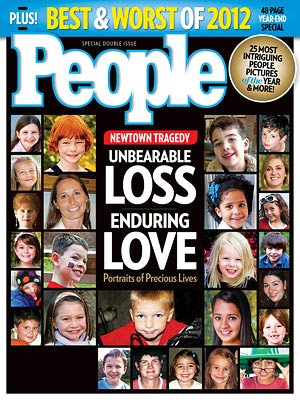 I'm looking forward to reading this issue of People tonight. What else? What have I missed? Please share with me things that are bringing you happiness after such sadness. . . 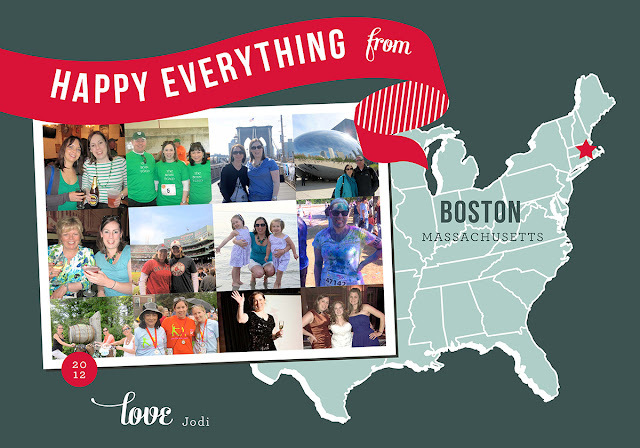 This is the first time I have made/ordered anything from minted and I was really pleased with the selection and service. 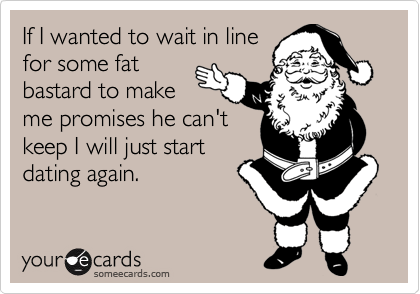 I was having a hard time coming up with what I wanted for my Christmas card and when I saw this it was perfect! They proof read my draft and even caught a (minor) mistake. Production and shipping were super fast. I made the cards on a Friday night and had them in the mailbox on Wed! I will definitely use them again. On Saturday I went to brunch at Church of Boston. 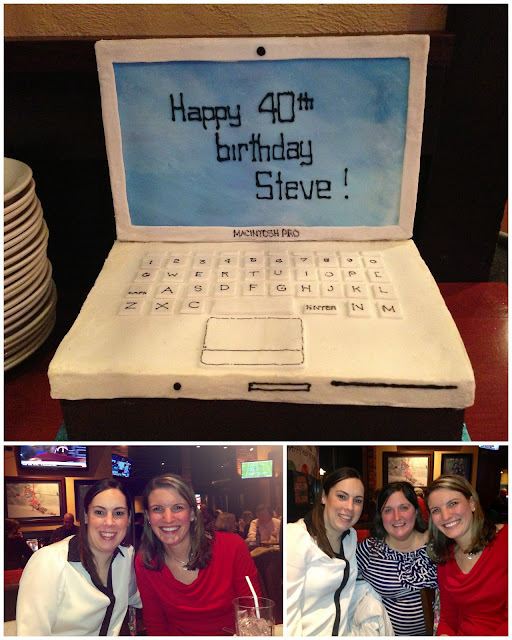 The event was organized by Blog and Tweet Boston and was open to Boston Bloggers. There were 9 of us who attended and I had met all but 3 at previous events. I had never been to Church of Boston and always enjoy checking out a new spot in Boston. 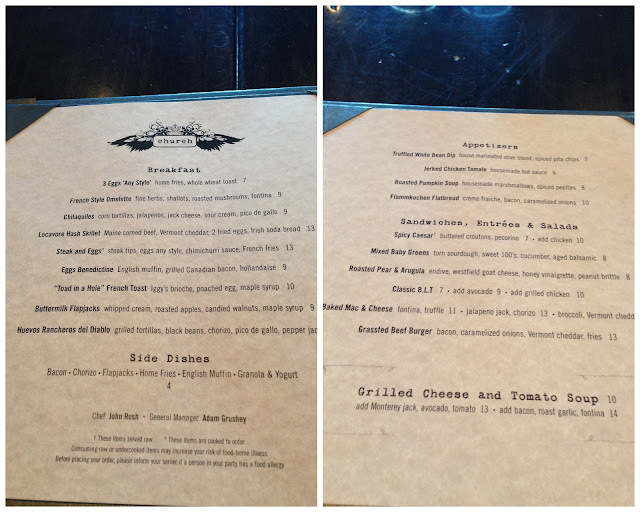 There were many great options on the menu and I would love to go back to try the mac and cheese! For this occasion chef John Rush offered to make us several different dishes for us to share and we all agreed! A great way to try many different dishes! I started out by ordering a L'Arc L'Oranj which is their version of a mimosa. It was good! 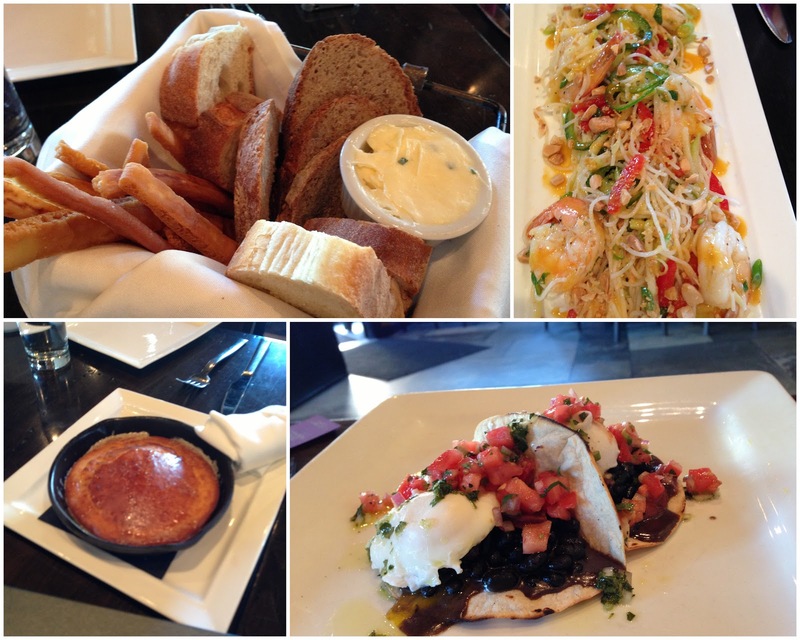 There were a few dishes that I didn't try due to something in it that I don't like (such as eggs, shrimp, meat, etc). So I can't really comment on those dishes. 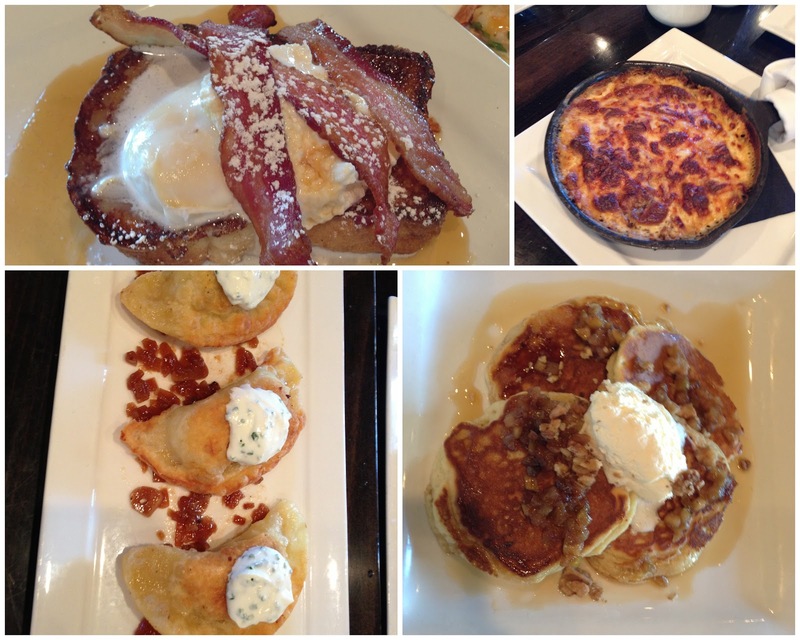 I did try the cornbread (bottom left) and it was really good! My favorite dish out of everything that we tried was the pancakes with roasted apples and lots of butter. They were delicious! Very sweet but I like sweet stuff so it worked well for me. There was a lot of food provided but we managed to eat most of it! Ha! The bartender made us a special drink/shot. It had a bunch of stuff in it which I can't remember. It was ok. I liked my other drink better! Now for dessert. . . it was all so yummy! I was already so full but couldn't resist trying everything. 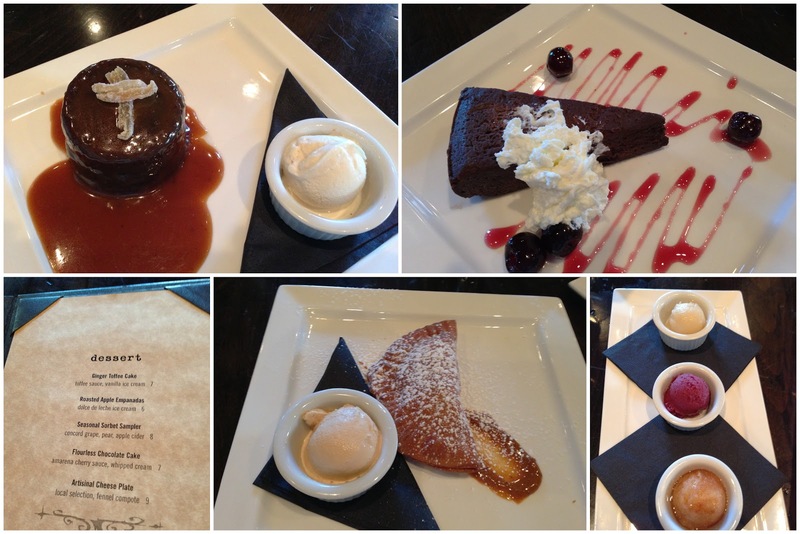 My favorite was a tie between the ginger cake (top left) and the flourless chocolate cake (top right). The ginger cake was loaded w/ warm caramel sauce and was so tasty. The chocolate cake was served with a few cherries and the combo was amazing. Mmmmmmmmmm! If you go make sure you order dessert! Here we all are at the end of our meal. All happy and stuffed. It was fun getting to chat with everyone while eating delicious food. I would definitely go back to Church of Boston in the future. The service was great. They have an area with comfy couches where you can relax while having a drink. They also have a nice bar area. If you go tell me what you think! The meal was free but the opinions are my own!